More information on how to conjugate both regular and irregular verbs in this tense, as well as example sentences, may be found below the video. You could notice that we don’t have a timeline representation for the Condicional tense as it doesn’t always refer to a particular time period. It’s actually similar to the English Conditional. The full name of this tense, which you may sometimes encounter, is Condicional Simple de Indicativo. Let’s have a look at its conjugation, usage and examples. The vast majority of Spanish verbs conjugate regularly in the Conditional tense. The conjugation is based on the entire, unchanged infinitive of the verb to which we add endings specific to each grammatical person. Check out the image showing all the endings. Note the shapes and colors of the letters. It should help you find patterns and make it easier to remember them. These endings are the same in all three conjugation groups: -ar, -er and -ir. They stay the same also in the irregular conjugation, which is described below. Note that the endings used in Condicional are identical to those used in the -er and -ir conjugation groups of the Imperfecto de Indicativo (Imperfect) tense. The difference is that the Imperfect uses the stem of the infinitive and the Condicional uses the entire infinitive. So we can see it’s the entire comer- at the beginning of each form, to which the appropriate endings are added. 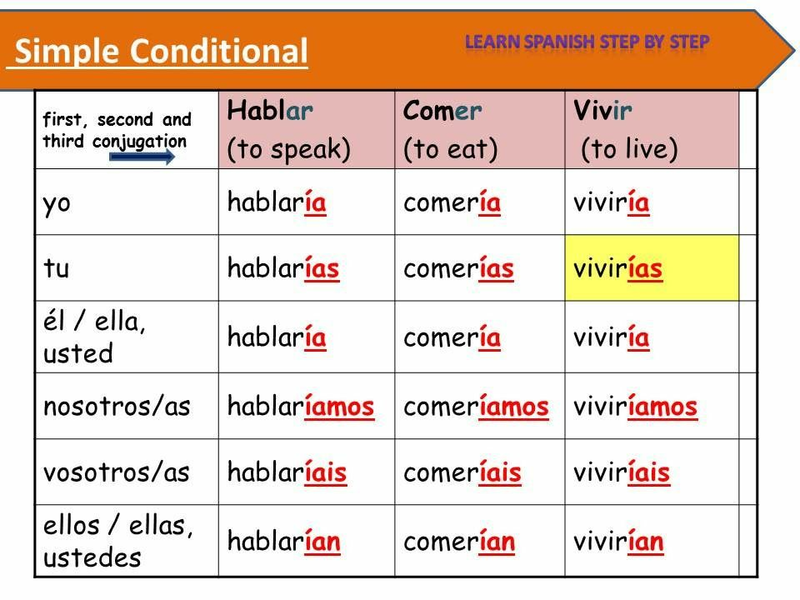 There are only several Spanish verbs which conjugate irregularly in Condicional. In case of these verbs, instead of using their infinitive to create each grammatical person’s form, we use an irregular stem. To this stem we add the exact same endings as in regular conjugation. ¿Cómo describirías tu vida en una sola frase? How would you describe your life in just one sentence? A mi también me gustaría saberlo hoy, pero tenemos que esperar hasta mañana. I would also like to know it today, but we have to wait until tomorrow. ¿Por qué razón te cambiarías de trabajo? For what reason would you change your job? Creo que él iría con nosotros, pero no tiene suficiente dinero. I think he would go with us, but he doesn’t have enough money. ¿Le mostrarías tu camioneta a mi hermano el sábado? Would you show my brother your truck on Saturday? Si tuviera más dinero, compraría este coche. If I had more money, I would buy this car. ¿Qué harías si ganaras un millon de dolares en la lotería? What would you do if you won a million dollars in lottery? Si pudiera, no volaría con ellos, pero no tengo alternativas. If I could, I would not fly with them, but I have no alternatives. Si Ricardo volviera a la ciudad, ¿podría quedarse en tu casa? If Ricardo returned to the city, could he stay at your place? Después de caminar tanto tiempo sin agua, tendrían sed. After walking without water for so long, they were probably thirsty. After walking without water for so long, they must have been thirsty. After walking without water for so long, they would have been thirsty. Aquél mes Pedro vendría más de cien conejos. That month Pedro must have sold more than a hundred rabbits. - ¿Dónde estaba tu gato en ese momento? - Estaría en casa, pero no lo sé. - Where was your cat at that moment? - It was probably at home, but I don’t know. Note that to make hypothesis in the present, we would use the Future tense. Otra vez se promete que mañana dejará de fumar. Otra vez se prometió que el día siguiente dejaría de fumar. Yo sé que lo harán tarde o temprano. Yo sabía que lo harían tarde o temprano. I knew that they would do it sooner or later. Si me permiten, me gustaría comenzar con hacer una declaración. If you allow me, I would like to start with making a statement. ¿Podría decirme qué autobús va a la estación de trenes? Could you tell me which bus goes to the train station? Querría pagar con la tarjeta de crédito, si no es un problema. I would like to pay by credit card, if it’s not a problem. Cuando yo era niño, pescaba con mi padre casi cada sábado. When I was a kid, I would go fishing with my dad almost every Saturday. When I was a kid, I used to go fishing with my dad almost every Saturday.